Insights into the history of gifting…through art! Don’t you ever get fascinated by the power of art to evoke spontaneous emotions in us? I bet anyone who is reading this post can think of at least one painting, sculpture, maybe a photo or a film, that takes them someplace else. But there’s more to it! Art helps us capture important information about our past to help us build a fuller picture of the world we live in today. Take this painting by Andrea Mantegna ‘Adoration of the Magi’ (1495-1505), which is currently displayed at the British Museum as part of the Ming Dynasty exhibition. Here, Mantegna depicts a moment of the three kings paying homage to Jesus Christ and Virgin Mary. The Bible tells us the symbolic gifts are gold, frankincense and myrrh. 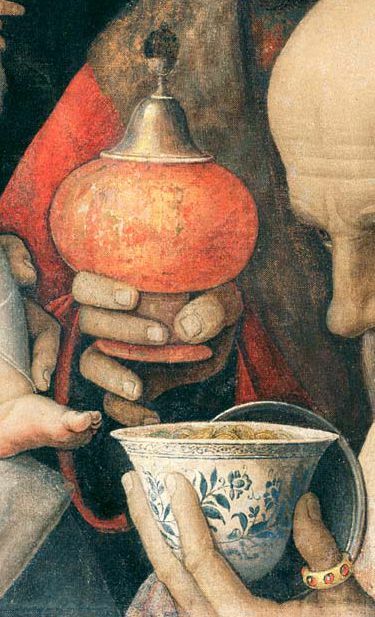 However, the way the gifts are presented offers an exciting sub-story about Mantegna’s time and the important geo-political processes that were taking place back in the 15th century. Take a closer look: the vessels which hold the gifts are of extraordinary opulence, arguably much more expensive than the gifts themselves. The white-and-blue cup represents a rare example of Chinese porcelain from the powerful Ming dynasty. Mantegna’s painting was the first cultural proof of the vast trading connections between China and Western Europe. It highlighted indisputable influence of the Ming Dynasty on European art, literature, music and fashion. Wealthy European families exchanged exquisite treasures of the East as gifts amongst each other, making them the most coveted and prized possessions. Most likely, Mantegna wanted to highlight the importance of the moment to his contemporaries by choosing the most luxurious (and almost impossible to get!) gifts of his time. Previous PostSali Hughes is ‘pretty great’ at gifting – here’s why!